This cozy home is considered by us as a classic kiwi bach by the beach. The home catches the sun all day with a great entertaining deck off the living area and a sun deck off the rear of the two main bedrooms. 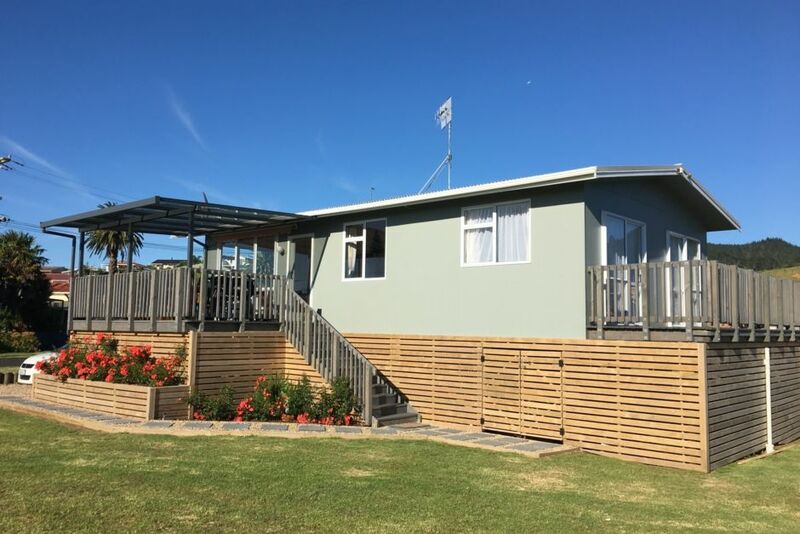 It is located in the north-end of Waihi beach close to the holiday Park, cafes and shops, Waihi Beach surf club and only a 200m walk to the water. You can enjoy water activities, beach walks, bush walks, fishing or just relaxing with a book. The family friendly beach is great to enjoy, surfing, swimming and most other water sports. Good fishing is just off the beach and a boat ramp 8km away. The stunning walk to Orokawa Bay through the scenic reserve is a must for nature lovers with beautiful NZ native bush and the isolated golden sands of the bay. A short drive away through to the Karangahake gorge has spectacular walks through the historic mining area including a cycle trail. Nearby you can sample wines or enjoy a lunch at the Ohinemuri Estate winery. 1km away the Waihi Beach Village shops are a nice convenience including a bakery, 4 square supermarket, a number of cafes and restaurants, bottle store and butcher. It is a cozy but pleasant living space. Our occupancy is for max 7 but it is really suitable for 4-5 people comfortably. Families preferred. No Pets. Please bring your own linen and towels. Shoes off in the home. No parties and no additional guests staying beyond those booked. No smoking inside or in the property grounds. All rubbish to be removed on departure and home to be cleaned as it was found. Cleaning option available. Nice indoor - outdoor, easy to clean living space and good lawn area for kids to play on. toilet, tub, shower, It is a combined toilet, shower, laundry and wash room. About 200m to Waihi Beach sand and surf, so close you can smell it. Normally we ask renters to bring their own towels, sheets and a pillow case. We have matress protectors, duvets and pillows for al beds. The bathroom has a foot mat and hand towels. We have a Westinghouse front load 7kg washing machine. It is a easy to use kitchen with all the expected utilities. Do dishwasher though. Quality time doing dishes the old fashion way with a glass of wine. The back is set up for cable connection. Bring your own sky decoder and enjoy your own sky connection like you were at home. It has initial stars up to the decking and then house access. Lovely family Bach in an ideal location. Lovely family Bach in an ideal location. Highly recommend. Even better than we emagined. Even better than we emagined. Great place?? Even better than we emagined. Great place. Great location to beach and park, clean and tidy property. Great location to beach and park, clean and tidy property. Bed's are comfortable and was a quiet location to stay. The neigbourhood is a mixture of friendly locals and holiday homes like ours. There is a spacious reserve park and a commercial holiday park close by. A very popular cafe called the Flat White Cafe is a 15 minute walk away for delicious coffee and food.